The Russian Hockey Federation's 16-man roster for the World Cup of Hockey mixes established names such as Alex Ovechkin and Evgeny Kuznetsov with up-and-comers such as Nikita Kucherov. 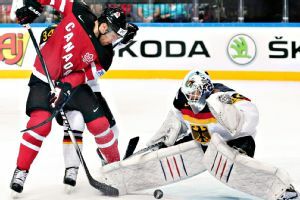 Canada eased to another high-scoring victory at the ice hockey world championship on Sunday by overwhelming Germany 10-0. CHICAGO -- Heres a quick look at the Chicago Blackhawks 4-1 win over the New York Islanders on Tuesday at the United Center:How it happened: Jonathan Toews scored twice in the first period, and that was enough support for Blackhawks goaltender Corey Crawford. Washington Capitals wing Alex Ovechkin and Vezina Trophy-winning goaltender Sergei Bobrovsky will lead Russia in the world ice hockey championship starting in Minsk, Belarus, on Friday.